The purpose was to determine the clinical performance of NexxZr T full-contour zirconia restorations at three years or more after cementation. A total of 475 NexxZr T full-contour zirconia crowns and bridges were placed over the past five years. 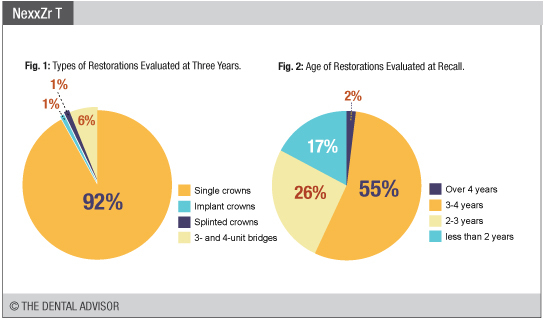 At three years, 370 restorations were recalled including: single crowns, implant crowns, splinted crowns, and 3- and 4-unit bridges (Figure 1). Two percent of the recalled restorations were anterior crowns and 98% were posterior crowns. The restorations were cemented with adhesive resin or self-adhesive resin cements. The majority of the restorations recalled at three years were fabricated by Apex Dental Milling, Ann Arbor, Michigan. Of the 370 recalled restorations, 2% were over 4 years, 55% were between 3 and 4 years, 26% were between 2 and 3 years and the remaining 17% were less than 2 years old (Figure 2). Lack of sensitivity was excellent (Figure 3). Over a three-year period, eleven patients experienced minor to moderate postoperative sensitivity that subsided within three months after placement. Ninety-five percent of the restorations were reported to be comfortable. 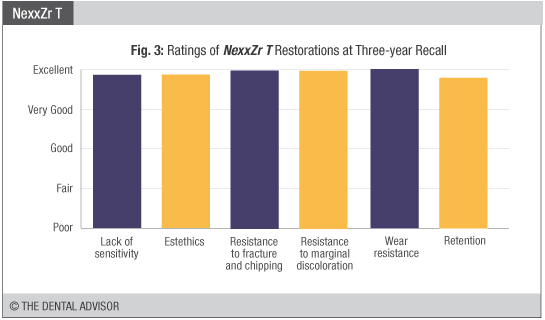 The esthetics of NexxZr T restorations also received excellent ratings (Figure 3). Beyond three years in service, 95% of the restorations exhibited shades and surface textures analogous to when the restorations were initially placed. Only 5% of restorations received a rating of 4 (very good) based on slightly lower esthetics. Full-contour zirconia crowns are more monochromatic than layered ceramic restorations; however, this is often an asset in the posterior region where discolored stump shades can be a challenge. Ninety-five percent of the crowns and bridges maintained excellent esthetics. Wear resistance was excellent (Figure 3). There was almost no evidence of wear on the restorations or opposing teeth. For patients with severe bruxism or those where minimal clearance can be achieved, NexxZr T crowns are an excellent choice. Seventeen of the 370 restorations recalled debonded over the three-year recall period. The debonded restorations were single crowns on molars and were recemented successfully. In the posterior region where bruxism, minimal remaining tooth structure and isolation are often challenges, 95% retention is excellent (Figure 3). 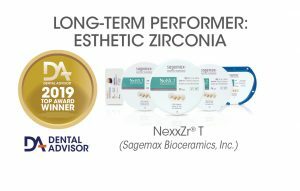 The three-year recall proved NexxZr T to be an excellent full-contour zirconia with excellent resistance to fracture and chipping fracture and dependable esthetics and retention. 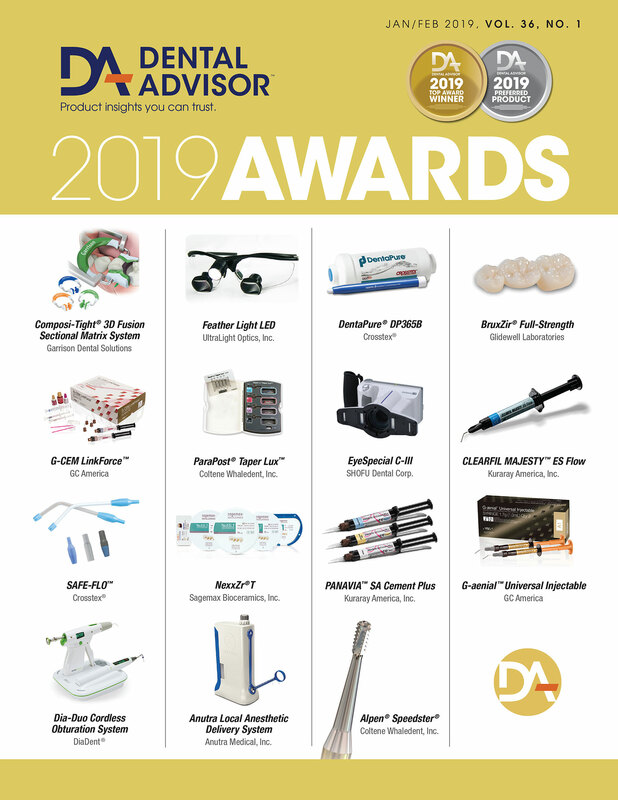 NexxZr T received a 98% clinical performance rating.